The Turner 2018 upfront in The Theater at Madison Square Garden showcased Turner’s premium entertainment, news and sports brands and their multiplatform franchises with a dynamic visual canvas that amped up the experience for the advertisers and marketers packing the audience. WorldStage once again teamed with ATOMIC and PIX Productions on this annual pitchfest: WorldStage provided AV support while ATOMIC handled technical production and PIX Productions managed the creative direction and production. “I think this marked the sixteenth Turner upfront we’ve all done together,” says Executive Producer Soren West of LA-based Soren West. “The longevity of the partnership speaks for itself. Everyone enjoys working with each other, trusts each other and has fun. “Turner always has a unique set design with lots of three-dimensionality,” says WorldStage Account Executive TJ Donoghue. “They know how to deliver wow and punch in a very immersive way.” Scenic design was by ATOMIC production designer Mike Rhoads in tandem with the creative direction of PIX Productions. The main goal of PIX Productions was to utilize “the massive amount of star power that Turner has,” notes Director of Production Jeremy Nichols. “There was a large cast of celebrities through the multiple Turner brands to highlight onstage and onscreen simultaneously. We created media and designed the scenic focusing on depth in space. 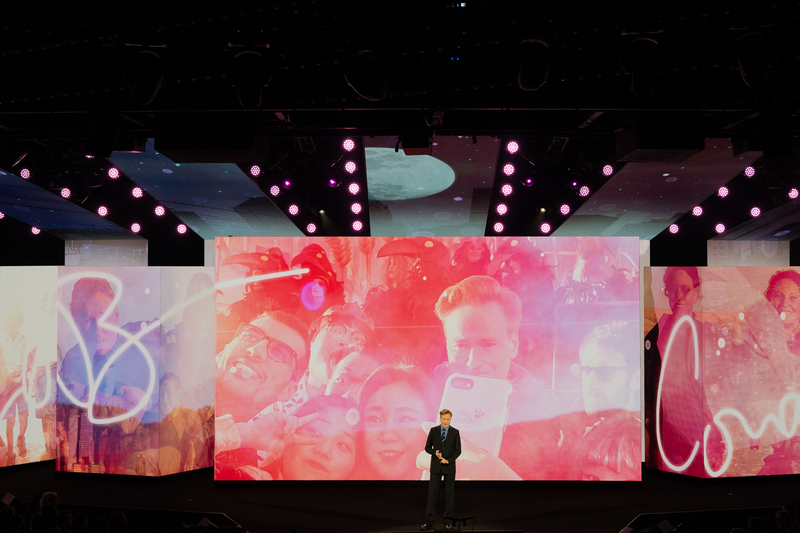 We also used different aspect ratios – portrait-mode and square screens – to acknowledge the native aspect ratios of social media screens since Turner’s ‘We Make Fans’ message was an important piece of the upfront.” PIX Productions has had a 20-year relationship with WorldStage; the Turner 2018 upfront marked the first time that PIX Productions was responsible for the overall show design. Shaun Boyle was the company’s Executive Producer. At this year’s upfront three layers of LED screens filled the 60-foot deep stage and five LED panels formed a ceiling piece or “crown” angled over the screens. WorldStage provided the brand new, customized, high-resolution c3ONE LED tiles for all of the displays. With a 3.1mm pixel pitch the tiles offer the maximum in flexible configuration, superior visuals and dynamic design for indoor events. Their larger tile form factor and lightweight frame make for fast load in and set up of innovative set pieces. WorldStage also supplied two active and two back up disguise 4x4pro media servers to drive the displays and a pair of new Christie Spyder X80 multiscreen windowing processors to switch the keynote graphics. According to Laura Frank the Spyder X80 helped her “not think about” the huge amount of processing required for such a large canvas. “Given the amount of pixels I needed to transmit, the X80 made the process transparent,” she says. Working with Frank on her team were Content Manager & Associate Screens Producer Kerstin Hovland, Daniel Jackson, Co-Content Manager, and Kirk Miller of Earlybird Visual as disguise programmer. The upfront’s camera complement featured seven Sony cameras for broadcast, IMAG and live streaming. WorldStage configured one camera with a jib, one for Steadicam, one for robotic use, one for hand-held coverage and three on sticks. A Grass Valley Karrera production switcher was also on hand. Even before advertisers and marketers arrived in the theater Optimist Design set the scene for the upfront in the corridor and lobby. WorldStage provided 300 ROE LED strips fed with imagery to draw attendees down the long hallway and into the lobby. Optimist set a giant Turner logo – each of whose letters was eight feet tall – into the half-moon curve of the lobby where it was projection mapped with imagery. “Having the familiarity of the core WorldStage team onboard for the upfront was really helpful to us and important to the success of the project,” adds Jeremy Nichols.